Great ideas often ﬁnd their genesis in something that its creator has already been doing for a long while. Writer, curator and collector Larissa Leclair has been embodying this notion in her new project the Indie Photobook Library. Founded in 2010, the iPL is an archive of self-published photobooks, zines, catalogs and other printed matter whose intent is to be seen in person through traveling exhibitions and as a non-circulating public library. In addition to Leclair’s efforts, the iPL has an advisory board of several people who are likely well known to readers of this blog: Andy Adams, editor and founder of Flak Photo; Darius Himes International Head of Photographs at Christies and co-founder of Radius Books; Shane Lavalette, photographer and founder of Lay Flat; and Gabrielle Reed, of the Massachusetts College of Art’s Godine Library. 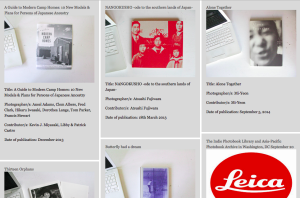 Accepting photobooks from all over the world, the iPL has been enjoying a period of exponential growth. I recently talked with Larissa about the iPL and where she thinks things are headed next. What is the genesis of the iPL? Did it begin with your personal collection? If so, how long have you been building/collecting it, and what was the impetus to turn it outward and make it a public collection? LL: My interest in archives began in graduate school, when I spent most of my time researching and working in Manuscripts & Archives at Yale University Library with photographs, postcards, ephemera and books. Now each year I try and return to Yale for the Master Class at the Beinecke Rare Book and Manuscript Library co-organized with the Photo Memory Workshops, which I had been a part of during school. The class is an amazing opportunity to spend time with an entire collection along with the photographer of the collection or expert scholar on the collection. The most recent Master Class this past April 2010 focused on the Peter Palmquist Archive. Peter Palmquist’s life mission after retiring was very inspiring and his collection has and will have a big impact on the history of photography specifically relating to women in photography since the late 1800’s. The passion and vision encapsulated in his collection was the ﬁnal piece of encouragement I needed. The idea of creating a public non-circulating library has been in my head for many years. It was an idea I wanted to bring to the table for a non-proﬁt organization and at that time my focus was a broad range of international titles and making them available to a US audience. That initiative never materialized, but the idea stayed and evolved. In the last year or two, I have been personally frustrated with not being able to view most of the self-published books out there in person. So the idea of wishing for a central place to look at these kinds of books was in my head on the day I saw Peter Palmquist’s collection. I was blown away that a single individual could follow his passion, create a collection, and in the process have an impact on the history of photography. I was not only interested in promoting indie published books, but I was very interested in creating an archive. So two weeks after the Master Class, I plunged into the reality of overseeing a public collection. It was the right time and I knew I would regret the decision if I did not start the Indie Photobook Library. The iPL was started for many reasons—the two main ones being—preservation and showcasing of these independent, self-published books to be SEEN (not just on the web) and for the future—a collection of books that decades from now people will still be able to see in person. Having a speciﬁc collection dedicated to these kinds of books allows for the development of future discourse on trends in self-publishing, the ability to reﬂect on and compare books in the collection, and for scholarly research to be conducted in years, decades and centuries to come. Sometimes you wonder where your path is leading you, but once you get there it all makes sense. The iPL is my destination and I will be working on it for the rest of my life. 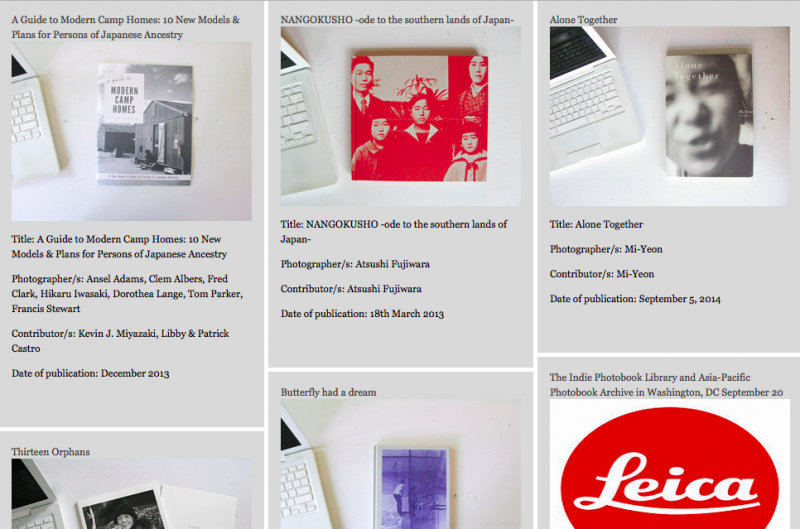 Search results for “Japan” at the indie Photobook Library site. Does the iPL accept everything it receives? What is the curatorial process like? If there is a single criteria for inclusion, what would it be? LL: For now the iPL accepts everything it receives. But with that in mind the iPL only accepts photobooks that are self-published, independently published and distributed, exhibition catalogs, print-on-demand photobooks, artist books, zines, photobooks printed on newsprint, limited edition photobooks, etc. Are there plans to make the iPL more accessible online? Perhaps a ﬂip-preview like with Blurb books, or photo-eye’s sneak peak? How does the iPL ﬁt into the same milieu as things like Self Publish, Be Happy; The Independent Photobook blog—are you all a part of the same dialogue? Where do you intersect, where do you clash? LL: I think we are all celebrating the photobook, and speciﬁcally the self-published and indie published photobook, but we are promoting them in our own way. The iPL is the only physical archive. What is your deepest hope for the iPL? What is its ultimate reach? LL: I have very ambitious goals for the iPL. I hope it will be seen as the “Library of Congress” for self-published books and that photographers will continue to add to the collection as they create new books. Once the iPL has a space of its own, I hope to have the collection listed on worldcat.org. And in thirty years or so, the entire archive will be donated as its own collection to a much larger university or museum archive to be preserved and be accessible for future photo-bibliophiles long after my lifetime. What challenges do you face in getting the iPL out into the world? What other challenges are there that someone who is not so intimately involved would not think to consider? LL: Time. The iPL has already turned into a full-time project and I am happy about that, but we will need a full-time staff person to oversee the day-to-day maintenance of the collection so I can also focus on further development. How to do that without ﬁnancial support is a good question but one that will be answered in the future. Another challenge is the language barrier. I want the iPL to have books from every corner of the globe. We have gotten the word out in Iran through Dide Magazine and I am reaching out to photo communities in the Middle East and Africa. News is spreading of the iPL and already we have books in the collection from Serbia, Iceland, China, Taiwan, Peru, Argentina, Finland, France, Germany, Netherlands, Italy, England, Singapore, New Zealand, the United States and Canada, to give you an example of some of the countries. What is a typical day like working as the curator/promoter/voice of iPL? LL: We receive submissions every day, so a typical day always includes looking at books that have come in and sending out a conﬁrmation email, cataloging them for the iPL website and our records and then announcing the new books that have been added to the collection through social media, our RSS feed and by email to those following the iPL. Currently we are getting ready for the Flash Forward Festival and FotoWeek DC, writing grants, preparing our information for Kickstarter.com and looking for space. Tell me about a couple of your favorite most recent submissions/ﬁnds. LL: I don’t want to label any of the books in the iPL as favorite of mines. But I can highlight some recent submissions that people should check out. NY low and high by Marco Onofri, Clinic, Depressive Landscapes, Waterfall, anything by Matt Austin or Andrea Stultiens, Kitintale by Yann Gross, Pause to Begin… There are just too many great photobooks … See You Soon by Maxwell Anderson, Eastward Bound, How Terry Likes His Coffee…. In July I met with George Slade at the Photographic Resource Center in Boston and brought with me two boxes of books that I had selected from the iPL. In many ways it was a personal guided tour of the iPL where I presented and compared and discussed, and three hours later, we barely felt we had begun. So I could go on and on about which books you should look at. And I am pleased to say that George will get to spend more time with some of these books, because he and the PRC will be hosting a curated exhibition from the iPL collection next Fall 2011! Aside from traveling festivals, are there plans for a more permanent home for the iPL? LL: Yes, the iPL is actively looking for a space. The traveling exhibitions are an initial way to showcase the books in the collection, but ultimately I hope to have a public space that operates like a non-circulating library where people can come in and browse the shelves. I would also like to have a small gallery area in the space for rotating exhibitions from the collection. And I am interested in the idea of letting larger institutions borrow a book if needed for an exhibition they are mounting. If and when the iPL has the happy problem of outgrowing itself, how do you see yourself adapting to the duties and demands of its growth, and what steps to grow it even further would you like to take? LL: I am smiling. The iPL has already outgrown my ofﬁce and I am looking for that space you asked about in the previous question much sooner than I originally anticipated. The iPL will be continually adapting to the duties and demands of its growth—and I like that. That makes it exciting and limitless. As far as the logistics of an ever-growing collection, that is where it will get challenging. The iPL has applied for a grant and will soon be joining the other fundraising projects on Kickstarter.com and we have welcomed Stephanie Obernesser as our ﬁrst intern this fall. Has your role as the curator/caretaker of this collection inﬂuenced your own buying, viewing and book-appreciating habits? Would you, for example, still want to put your hands on a popularly or more widely produced title by one of the more well known art presses, or is there a kind of conversion that takes place, where your independent values must be lived and choices made by them? LL: In the end they are all photobooks. I am still just as interested in traditional trade editions as I was before. I have been collecting photobooks for over ten years and most of them fall into the category of what you described as “produced by the more well known art presses.” And I have a section in my personal collection of titles relating to contemporary African photography. What has changed recently about my buying habits is that I am now buying more “indie” publications. Through the iPL I have the opportunity to see more non-traditional publications and because of this am buying more books. And I hope that same impulse will affect other people looking at the books in our library. Is there room for everybody in the art press publishing world? Room for every kind of approach? In your view, are the more tried and true traditional ways of doing things (i.e. big, expensive, prestigious presses) dying out? LL: I wouldn’t say dying out, but with the surge of self-publishers and indie labels, I assume it is probably a lot harder for the traditional presses then it used to be. The photobook market is only so big and there is so much out there to buy and collect. What is some of the feedback that you’ve received about the iPL that has most surprised you? LL: The feedback and support of this project has been amazing and overwhelmingly positive. I am hearing that photographers are selling books after someone has seen it in the Indie Photobook Library. That is some of the best kind of feedback. Why is it important to collect photobooks at this particular place and time? In an age of ﬂeeting ephemerality, is there something counterintuitive to trying to hold onto the material? LL: It is inherent in my own behavior to collect. I understand the nature of collections and archives. I don’t like the ﬂeeting ephemerality of information, images, time and really enjoy looking at history through an accessible archive. I started the Indie Photobook Library just days before I read the article that appeared in the Boston Globe on May 24, 2010, titled “Harvard’s Paper Cuts.” I read it in a nervous sweat. The article made me second-guess my decision as I thought about what I had just started. If one of the largest libraries and archives was collecting less physical material, what was I doing? Archives shouldn’t follow trends but collect the things that shape them. On a consumer level, digital material may be more practical, but I am still interested in the physical object and I think the role of the archive should be too. What is shifting within archives is how the collection and material is used and shared. And for that I think the more that is digitized and available online the better. What do you see in the independent, self-published book market that is different and/or of a particular and rare value from the mass market? LL: Individuality and creativity. It may be an idealist’s view but the physical expression of the book as object and idea is not as inﬂuenced by commercialism. The production of the indie book may be approached from a different perspective than a mass market book. The photographer is in control of the decisions and thus the end result is just as much an expression of the artist as is any of the photographs. It goes beyond just a book of photographs. Tell us a little bit about the inaugural iPL event, the Toronto Flash Forward festival. How will people be encouraged or inclined to use the library? What will distinguish it from an art press book sale stand? LL: Stephanie and I are busy getting ready for the Flash Forward Festival and we are very excited to be part of the “Self Published Book Expo.” The iPL will be showcasing its entire cataloged archive and people are invited to spend hours looking through all the books. It is such a diverse collection, from exquisite hardcover books to softcover zines, newsprint books to limited-edition artist books, print-on-demand books from Blurb and MagCloud, and everything in between. Check out our website to see the books that will be on view. Self Publish Be Happy will also be there showing a curated selection and I look forward to seeing the books selected by Bruno. None of the books in the iPL are for sale, nor is the iPL set up to sell books at the Flash Forward Festival, however on Saturday October 9 from 4-6pm, if you have a book in the iPL and will be in Toronto you are invited to bring copies of your book to sign and sell during that time to festival visitors. Many, many thanks to Larissa for taking the time to so thoughtfully answer my questions about collecting and the world’s ﬁrst Indie Photobook Library! Keep up to date with news and chances to view the iPL over on their website. The iPL also has a twitter feed and a Facebook page. If you have a book that you are interested in submitting to the collection, check out the submission page. Once upon a time, I was a contract writer, pitching and writing about contemporary photography for Jen Bekman over at her 20×200 site (and other associated brands). The archives of stories on the sites disappeared when the company re-structured and re-launched, and some of the people and projects I wrote about then I believe deserve a longer virtual life. Each Thursday for the near forseeable future I will resurrect one such piece and publish it here. All of these #throwbackthursday posts originated on the now defunct Hey, Hot Shot! blog.